Africa will be the last continent we plan to visit within our round the world trip. We would like to visit more countries than are on our list. But after all that traveling around the world we will definitely be tired and let’s be honest our financial resources won’t probably be so big at that time. 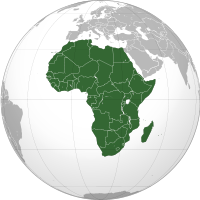 Besides that, we plan to visit several locations in Africa. We will travel to Africa from Asia and thus we will stay a while in this charming Arabic world. In fact we will be at the places closest to Europe but then we will move away again for a while. It might sound a little strange but our travel plan showed us that it is the best and cheapest possible solution. Of course we are talking about Egypt, a country in the Middle East, which played a big role in the past for all mankind. We are speaking about the breathtaking and monumental architectural gems that were built by the pharaohs who ruled this country. The mysteries of these incredible buildings are still unclarified. Egypt is without doubt a country that is still largely undiscovered and where it is possible to explore what our ancestors were able to build in the remote past. Can we say that we were on trip around the world without going on a true Africa safari? We think that it’s the experience that we cannot miss. Seeing animals in their natural environment must be an amazing experience. Kenya in this way seemed to be the best option. So we added it to our itinerary! But we would like to compare therefore we want to have a look at the animals as well in a national park in neighboring Tanzania. And hopefully we’ll be lucky and will manage to take a photo of Mount Kilimanjaro. National parks are not the only places we want to visit in this country. We want to have a rest after all the busy months of traveling. Tanzania is our last destination before traveling back home. We will let our round the world trip take us to the island of Zanzibar where we will enjoy the last moments of our dream fulfilled, before we go back to the reality of everyday life. But we will not be sad because we know that we will have a beautiful life no matter where we are.